Figure 1. Inclusions in the 1.70 ct ruby from Montana. Left: Close-up of a glassy melt inclusion with an associated thin film showing geometric patterns; field of view 1.76 mm. Right: A melt inclusion with an iridescent thin film, partial hexagonal zone of particles, and short needles; field of view 3.81 mm. Photomicrographs by Claire Malaquias. The Carlsbad laboratory recently received a 1.70 ct purplish red octagonal modified brilliant-cut ruby measuring 6.28 × 6.25 × 4.56 mm for an identification and origin report. Standard gemological testing gave a chromium spectrum indicating ruby and a hydrostatic specific gravity (SG) of 4.00. The stone displayed a weak red fluorescence in long-wave UV and no fluorescence under short-wave UV. Microscopic examination showed an interesting combination of inclusions (figure 1). There were several glassy melt inclusions and small crystals with associated reflective thin films. The thin films often displayed hexagonal geometric patterns conforming to the crystallographic orientation of the host ruby. These resembled the patterns commonly seen in rubies from Thailand and Cambodia and have also been documented in Montana corundum (Fall 2015 Micro-World, pp. 329–330). A partial hexagonal zone of particles and more loosely spaced unaltered exsolved rutile needles was also present, a feature that would be very unusual in Thai/Cambodian rubies. A large intact colorless crystal as well as smaller white crystals were located deep within the stone, so we were unable to conclusively identify them with Raman spectroscopy. This inclusion scene is consistent with unheated corundum from Montana. Figure 2. The 1.70 ct Montana ruby alongside rough pink to purple corundum samples from the GIA reference collection. These reference samples, collected from Montana’s Eldorado Bar along the Missouri River and Wildcat Gulch, part of the Rock Creek deposit, were used to help determine the country of origin. Photo by Robison McMurtry. 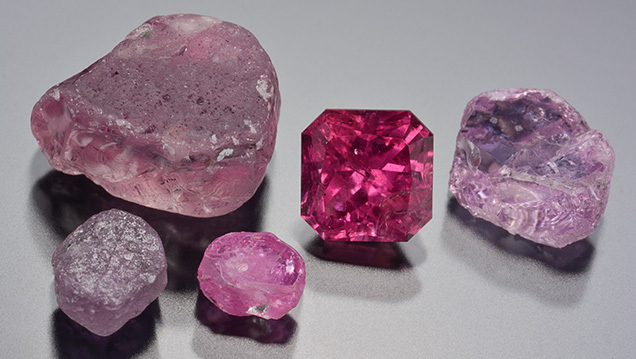 Laser ablation–inductively coupled plasma–mass spectrometry (LA-ICP-MS) was used to determine the stone’s trace-element chemistry, and the results were compared to corundum samples from GIA’s colored stone reference collection. Trace element measurements indicated ranges of 15.1–17.2 ppma Mg, 14.7–16.9 ppma Ti, 3.67–3.87 ppma V, 359–406 ppma Cr, 1500–1580 ppma Fe, and 14.6–14.7 ppma Ga. The chemistry matched well with reference stones GIA has collected from Montana’s secondary deposits (figure 2) but not our Thai/Cambodian ruby reference samples. In particular, Thai/Cambodian rubies tend to have higher Mg (often above 100 ppma), while this stone had much lower Mg levels. Montana’s secondary deposits produce sapphires in a wide range of mostly pastel colors. Pink corundum tends to be rarer than blue or green, and those that possess the depth of color to be called ruby are quite rare, particularly without any treatments. The color, combined with the large size, makes the 1.70 ct ruby from Montana an exceptional specimen—this is only the second such report issued by the lab to date. With a combination of microscopic observation, advanced testing methods, and GIA’s reference collection, we were able to confirm the country of origin. Claire Malaquias is a senior staff gemologist at GIA in Carlsbad, California. Two-phase inclusions are investigated in alluvial sapphires from deposits in Montana.